The pioneer nature of ESTEIO in the various activities related to Mapping, Photogrammetry and Rural Cadastre and the constant improvement of productive processes enabled the company to be consolidated within the Engineering market and to gradually increase its participation in the Brazilian Cartography history. 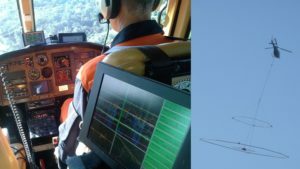 From its escalation to the category “A” (EMFA) of Aerial Survey companies in Brazil to its latest investments in the field of Digital Mapping, Esteio has always been very close to the greatest technological advances in over 40 years of existence. Access the links related to the years in which significant events occurred for the evolution of procedures and the employment of cutting-edge technology and verify ESTEIO’s firm decision in always investing on the best to serve its clients. An evolution of Leica RCD30 medium format stand-alone camera, the world’s first medium-format multispectral camera, Leica RCD30 Oblique has photogrammetric features, offering in addition to high-precision, superior quality images with great flexibility. Leica RCD30 Oblique camera allows simultaneous use of three or five sensors (Penta) mounted on a single device for urban mapping or corridor applications. Customers can choose between CH61 sensors, producing only RGB images, and CH62, producing multispectral RGBN images. ESTEIO used HxGN Leica RCD30 Penta sensor for an aerial survey over the Olympic Village Park in Rio de Janeiro, headquarters of the 2016 Olympics Games. The flight covers an area of 16 km2 with a total of 850 vertical and 3,400 oblique photos with pixel size on the ground (GSD) of 5 cm and 2.3-3.5 cm respectively. The images are exceptional and show the greatness of this Olympic game site. 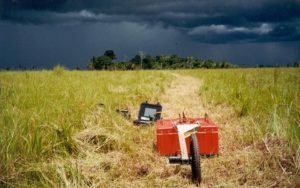 As diversification of the company’s operating market, in 2015, ESTEIO signed an JOINT VENTURE AGREEMENT with the company Geotech Aerial Surveys S.A. for the purpose of prospecting geophysical surveys. Aerial Geophysics is currently fundamental for mineral research, as it allows identifying underground areas potentially carrying concentrations of minerals of economic interest existing. ESTEIO works with Geotech LTD’s geophysical system, called versatility Time-Domain Electromagnetic (VTEM). 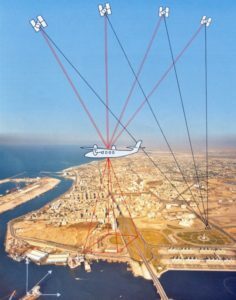 The VTEM Plus (versatile Time Domain Electro Magnetic) system is the most innovative and successful airborne electromagnetic system of the last 30 years. The proprietary design of the receiver offers low noise levels using the advantages of digital electronics and signal processing. The survey is done with an AS350B3 helicopter (or equivalent). This helicopter has the necessary flight autonomy to efficiently operate this type of equipment. The normal speed of the helicopter will be 50 miles per hour, but it can vary in mountain areas. With a data record rate of 0.1 point per second, the geophysical measurements are acquired approximately every 2 meters along the flight line. The technology has several denominations and acronyms being better known by MLS – Mobile Laser Scanning or MMS – Mobile Mapping Systems. 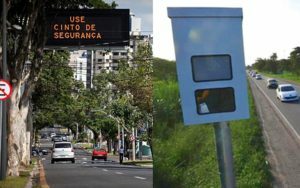 A MMS allow the collection of 3D information from thousands of points along a path combined with images and/or video, while travels at normal road speeds. It is a unified platform comprising a LASER scanner, a GNSS receiver, a Inertial Measurement Unit – IMU and a Distance Measurement Instrument – DMI. The LASER scans 360° of the road corridor with a range of up to 150m, measuring 1 million points per second. The cameras get images in a 360° view around the vehicle with resolution of 2 Mpx with 8 frames per second. The horizontal and vertical quality is bellow than 10 cm according to the use of control points. ESTEIO has surveyed “Avenida das Torres” (Avenida Comendador Franco), a large road that connects the International Airport of Curitiba to downtown, performing four types of surveys in an extension of 16 km – mobile laser, static terrestrial laser, aerial laser and orthophotos, in an unprecedented integration in Brazil that generated technical data of extreme value for the revitalization projects of this road. 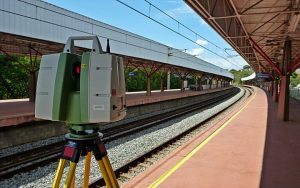 In 2013, Esteio used the Terrestrial LASER technology to survey Belo Horizonte´s subway stations in order to obtain AS BUILT. Leica ScanStation C10 equipment was used for this work. It has up to 300m range, 360 ° x 270 ° field of view, 50K points/s frequency, and versatility for survey internal and external sites. The ScanStation C10 allows measuring all the path of scanning positions, resection or use of targets to the orientation of the cloud of points and images. Cloud data and “AS BUIT” final drawings were processed with Cyclone software from HxGN Leica Geosystems Inc.
UAS Platform (Unmanned Aerial Systems). In 2012, ESTEIO and SIMEPAR Technological Institute signed a Technical Cooperation Agreement to create a joint venture to work together in the mapping and monitoring market using UAS (Unmanned Aerial Systems). Currently, UAVs and Low-altitude Photogrammetry are revealed as a set of imaging techniques that open new opportunities for users of aerial imagery by providing a faster and more direct acquisition in specific smaller areas where a traditional aerial survey is not the most appropriate solution. 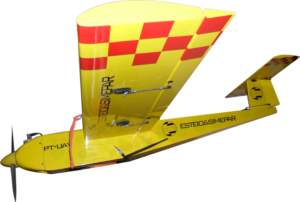 The integration of ESTEIO’s skills and experiences in aerial surveys as a SAE (Specialized Air Services) company, Airborne Sensors, Photogrammetry and SIMEPAR institute in UAS for Environmental Monitoring, results in a competitive differential of extreme significance and importance in relation to the exploitation of this cartographic segment in Brazil and worldwide. “ESTEIO and SIMEPAR have always invested significant efforts and resources in developing their own technology and expertise in Cartography and Special Surveys and now wish to combine their unique technical capabilities to increase their competitive possibilities with the constant commitment to offer reliable cartographic products and differentiated for users and customers desiring quality whatever the platform used.”, say Amauri Brandalize, Technical Director of ESTEIO S.A. and Eduardo Alvim Leite, Superintendent-Director of SIMEPAR Institute. In 2010, ESTEIO, once again in a pioneer way, introduced to Brazilian mapping market the RCD 105 digital medium format camera manufactured by Leica Geosystems. The choice of this medium format aerial camera is due to the numerous advantages that, e are offering our customers from now on. 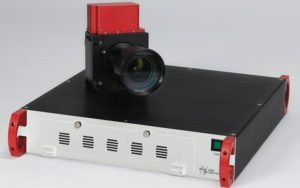 This camera has a 39 megapixel CCD – a frame of 7,162 x 5,416 pixels – capable of obtaining RGB or infrared images. It has the possibility of using three lens with 35, 60 or 100 mm focal length, shutter of easy and fast replacement, possible use of platform stabilization and simultaneous operationt with ALS equipment, sharing the use of highly accurate inertial navigation system (INS). The simultaneous operation of LASER and Digital Camera is particularly well suited for corridor mapping and smal engineering projects. We now have an important new tool that can reduce the costs of services without lose significantly the geometric quality however. The year of 2010 also marked the start up of Terrestrial Laser surveys in our company. At first, these surveys were restricted to static procedures, widely spread in the market and with applications in several areas. In order to supply the internal and customers needs, and added the experience acquired over the last 10 years in Airborne LASER Scanning, ESTEIO has incorporated its portfolio of services with Mobile Terrestrial Laser Surveys for many different purposes. This type of survey is suitable for highway engineering, to replace the conventional surveying method by mobile laser technology. The pioneering study was carried out along a boulevard with a length of 16 km linear, with three lanes in each direction. The data obtained in the survey covered among others: Alignment building, trees and their diameters, poles and towers and their diameters, curbs, drains, ditches, manholes and street furniture ( bus shelters, public telephones, etc.. ) well as traffic lights and signs which are usually the cadastral elements that can interfere in the development of highway projects. The speed and richness of data obtained from terrestrial mobile laser are much higher compared to those obtained by conventional surveying, in addition, it allows the survey to run at night, where traffic on the streets and avenues is not heavy. In 2009, ESTEIO acquired its second digital echo sounder (single beam) ODOM model HYDROTRAC. The equipment operates at 200 KHz frequency, which allows to reach depths up to 100 meters with an accuracy of 1 cm + 0.1 % of depth. The equipment also allows substitution of transducers, for example, the 33 kHz transducer, which reaches depths up to 600 meters. 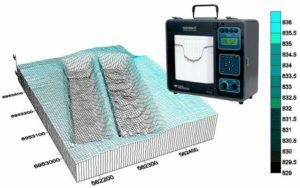 Also in 2009, ESTEIO acquired IDS ground penetrating radar, Model RIS MF Hi -Mod, a next-generation product developed primarily for mapping buried utilities (interference). Designed to surveys in urban and rural areas, the equipment allows the operation with two antennas at frequencies of 200 MHz and 600 MHz simultaneously to acquire data elements in the underground with a greater range in depth. In addition, ESTEIO updated its ADS40 digital sensor. The sensor is still named as ADS40 but the sensor head is now named SH52 model. The main advantages of this upgrade was the change of the previous image filter Trichroid to a new one Tetrachroid allowing for the acquisition of stereoscopic models in color & infrared, the improvement of image quality and teh possibility to fly higher keeping the image integrity. In 2008, ESTEIO purchased its third LASER scanning equipment. The second one of the Leica ALS50 model with capacity to obtain three−dimensional terrain coordinates with up to 16,000 points per second. The challenges of maintaining and managing roads with quality. The growing level of user demand and their need for safety. The continuous growth of traffic volume between medium and large size cities. The need for new road investments. Technology providers in ITS must provide more encompassing and safer solutions to the managers. ETT (ESTEIO Tecnologia em Trânsito − ESTEIO Traffic Technology) was created with this purpose and, with the Spanish Indra, formed IESSA (Indra ESTEIO Sistemas S.A.). It is the combination of expertise in technological development and capacity to implement complex solutions. IESSA provides specific systems, but it also is convergence in Road ITS. In addition to promoting systemic integration, IESSA was formatted to serve traffic managers in developing countries. The ITS market in Latin America and other developing regions demands appropriate solutions to the local needs allied to the decision-making agility. That’s why IESSA is, at the same time, developer, manufacturer and player. 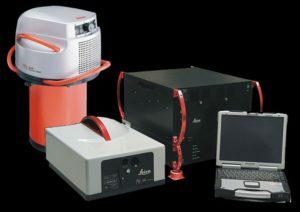 In 2006, ESTEIO brought to Brazil two new sensors manufactured by Leica Geosystems: the Airborne Digital Sensor − ADS40, capable of capturing images with resolution of up to five centimeters, and the 150kHz Airborne Laser Sensor − ALS50, capable of obtaining three−dimensional coordinates in the terrain of up to 150,000 points per second. It was the biggest isolated investment in our history. In 2005, ESTEIO purchased another cutting-edge technology equipment: the SBP (Sub-Bottom Profiling). It is a Sub−bottom Profiling System which works as a high-resolution profiler that transmits an FM pulse disposed in line over a carrier wave. 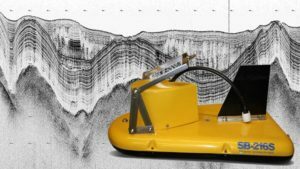 The acoustic return received in hydrophones generates high−resolution images of the sub−bottom stratigraphy in oceans, lakes and rivers, being able to operate in depths of up to 300 meters. For this year of 2004, ESTEIO has already invested in the updating of its Digital Stations, purchasing 10 Leica Photogrammetric Stations that will increment the set of already existing stations. With this investment, ESTEIO increases its productive capacity fourfold in Photogrammetric Capture, increases its production of Digital Orthophotos and Image Treatment threefold, in addition to incrementing the Digital Aerial Triangulation Services. To meet the services hired with extreme professionalism, as well as future service expectations, ESTEIO decided to increase its fleet purchasing another aircraft. 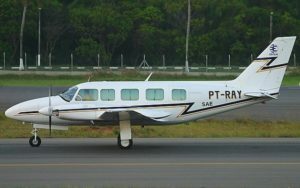 It is the PT-RAY prefix double engine plane. This year ESTEIO purchased 10 more units of the PCM (Pipeline Current Mapper) equipment for location and detection of potential damaged coating and breakage of buried pipelines. GPR has become an important tool in locating pipelines and buried wires. To prevent existing buried interferences is a prerequisite for all implementation of new enterprises. 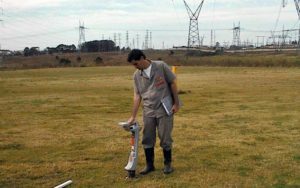 GPR provides data for the assessment of new lines and identification of buried obstacles. Planning before the drilling reduces costs and prevents unforeseen problems in work implementation. To serve its clients with this line of services, ESTEIO purchased, in 2003, a new SIR-3000 line GeoRadar equipment. This equipment enables various underground surveys, whether of buried elements or for ground stratigraphy. Diversifying its services in the fields of Oil and Gas, ESTEIO purchased specialized equipment named PCM (Pipeline Current Mapper) for the task of detecting buried pipelines. The detection comprises its horizontal and vertical location regarding the ground level. Another procedure related to this type of equipment is the definition of locations in the pipeline where the coating is damaged. This particularity enables the finding of potential focuses of pipeline deterioration and breakage, being a preventive maintenance activity and replacing more invasive and expensive methods such as drilling. This year, ESTEIO has incorporated the ALTM (Airborne Laser Terrain Mapper) into its set of cutting−edge equipment. This device acquires ground elevation data through LASER scanning, with accuracy equivalent to that of the GPS, but with much more speed and higher density. 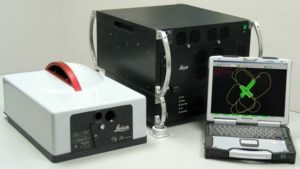 The airborne laser mapping system (ALTM − Airborne Laser Terrain Mapper) from Optech Inc. is an equipment designed to capture space coordinates (X,Y,Z) from points in the ground surface. It consists of a sensor with enclosed LASER with spectrum close to the infrared, inertial reference system, optical and electronic parts of the receiver and a control rack that comprises the computer components, controlled by a touch screen. When in operation, a high-precision LASER is directed to the ground through a hole in the aircraft floor. The LASER scans the terrain surface below the aircraft and records the distance to the ground for each of the emitted rays. From this point on, the space coordinate of each point measured is obtained through post-processing. Critical distance analysis from vegetation to LT. This year, ESTEIO purchased the GPR equipment, considered the most sophisticated equipment for scanning and low−depth surveys. Below there is a summary of the GPR technology. The GPR (Ground Penetrating Radar), also known as GEORADAR, is a geophysical survey method which basically consists of the continuous emission of electromagnetic waves into the ground. Part of these waves is reflected in deep structures or objects. The signals are emitted and received through an antenna placed on the ground surface. Speed and low cost in surveys, if compared to scanning or drilling, which are usually punctual studies. It is a non-destructive method, that is, in locations where there is vegetation, there is no need to cut down trees, and in cities it prevents the inconvenience of works, trenches, etc. Over a few years, ESTEIO has been gaining experience in the field of Geographic Information Systems (GIS) due to its actuation in geospatial data processing services. 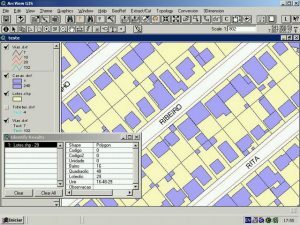 From the purchase of MapInfo and dbMapa software in 1994 until the year of 1999 with the purchase of ArcView (ESRI) and Autocad Map (Autodesk) software, ESTEIO always sought to maintain the diversity in GIS software knowledge and usage. This year, ESTEIO purchased the image compression system MrSID (Lizardtech) to provide raster products delivery in a compact and reliable manner. It has also updated its software licenses for ERMapper (ERMapper) to obtain a better performance in mosaic and image digital treatment in Remote Sensing. 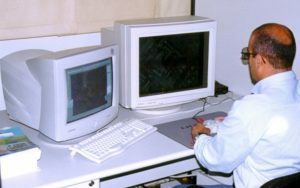 Throughout 1998, ESTEIO made a significant investment in the field of Digital Photogrammetry. In this period, it purchased three DPW 770 NT Digital Photogrammetric Stations from LH Systems to increase its productivity in Photogrammetric Capture. In addition, it purchased a new InterMap Analytic ABC-PC analytical equipment to be used in the model reading activities for Aerial Triangulation and Photogrammetric Capture. 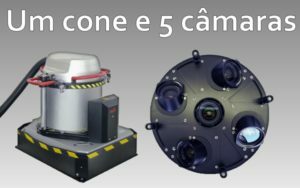 These pieces of equipment joined the already existing equipment in the company and doubled the productive capacity in Photogrammetric Capture and Aerial Triangulation. 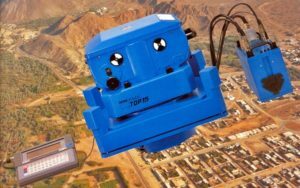 In 1997, following a philosophy of methods and equipment updating, ESTEIO purchased a ZEISS RMK−TOP 15 aerial analogical camera system, the most advanced system available at the market. This set is fully computerized and enables the automation of the aerial photograph shooting process. 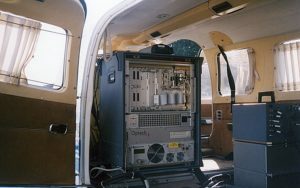 With this equipment, ESTEIO experienced a significant technological advance in the aerial coverage techniques and, consequently, in the other steps of the map generation process. In addition, operational costs were reduced and, consequently, final mapping costs were also decreased. 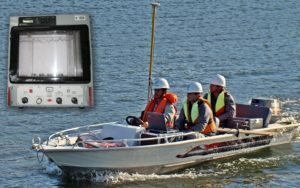 In 1996, ESTEIO purchased the ODON digital echobathymeter and HYPACK hydrographic survey software for Windows, starting to provide Bathymetry services with GPS. The GPS methodology adopted for Bathymetric Surveys is the collection of real−time coordinates, corrected by special radios, ranked as DGPS (Differential Global Positioning System). Simultaneously to the collection of coordinates (X,Y) the collection of (Z) coordinates is performed through digital echobathymeter reading. 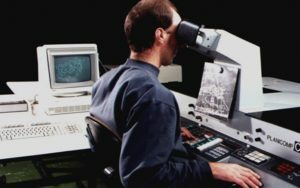 In 1994, ESTEIO purchased a digital orthophoto and image treatment system, which includes a LEICA DSW 100 scanning station and a LEICA DPW 770 image treatment station, in addition to the ERMapper 5.0 system for digital image treatment. This setting was chosen based on various experiences with suppliers from Germany, Switzerland, Canada and the United States. Keeping up with the technological evolution, in 1993, GPS and aerial photogrammetric coverage met. Through the purchase of GPS equipment for navigation and the preparation of the aerial camera and geodetic GPS receiver set, it was possible to obtain space coordinates of the perspective centers of aerial photographs in the exact moment of the shot. These coordinates are used in aerial triangulation with major reduction in the amount of ground support points. These coordinates are used in aerial triangulation with major reduction in the amount of ground support points. 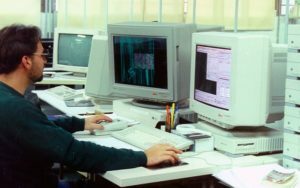 In 1991, ESTEIO started the development of a CAD system (TEMap − SEI n° 21.364−0) with the purpose of meeting the internal needs of numeric photogrammetric capture, digitalization, digital cartography edition. 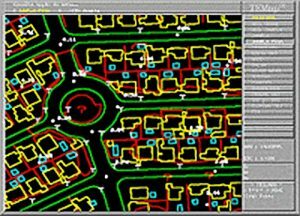 Still in 1991, ESTEIO purchased the DCA software (currently named ADVANCED DESIGN) which operates in AUTOCAD environment, introducing graphic computing also into the road engineering field. From July/92 to September/93, it developed to FERRONORTE the basic engineering design in digital media, using this system. 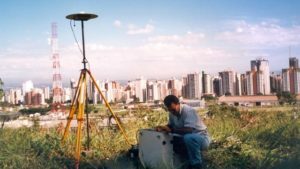 In 1990, with constant concern with the technological evolution, ESTEIO was, once again, a pioneer amongst the aerial survey Brazilian companies when it became equipped to perform geodetic operations with satellite tracers of the GPS NAVSTAR system, having achieved excellent results in services already provided both in terms of accuracy and productivity. Keeping up with the advances in the field of Remote Sensing, ESTEIO purchased in 1988 the SITIM / IGS image treatment system from Engespaço and started to use the geospatial data processing technology and digital treatment of images, aiming at the use of orbital images (from LANDSAT, SPOT or SOJUS satellites). 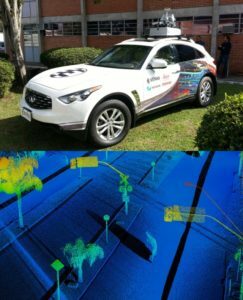 With this system, it carried out several geospatial data processing and satellite image treatment works, such as, for instance, the provision of technical engineering and thematic mapping services for a planning study of the gas pipeline Bolivia/Brazil for PETROBRAS. 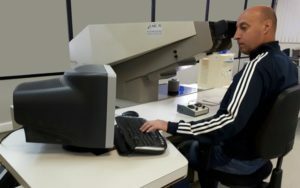 In 1985, with the purchase of a ZEISS Planicomp C−120 analytical station with HP 1000 minicomputer and retrieval PLANIMAP system and the automation of analogical equipment to make use of this system, it has become the first Brazilian company to be qualified to provide Digital Cartography Services. 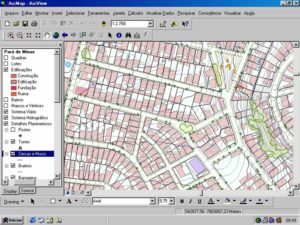 After that, the software was replaced by the TEMap graphic system developed by ESTEIO. 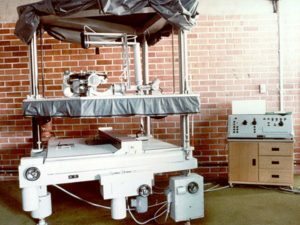 The automation of the photogrammetric processes was again incremented in 1986 with the purchase of a ZEISS Orthocomp Z−2 analytical orthoprojector with another HP 1000 unit. 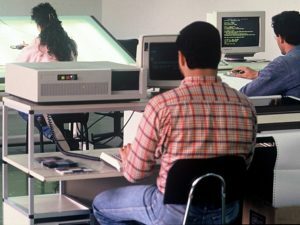 In the early days of personal computing, in 1981, ESTEIO acquired the first microcomputers (PC type) for application in engineering calculations replacing programmable calculators. This was the first step the company took towards the development of programs and products appropriate to its services and customers. In 1980, with the purchase of the Gigas−Zeiss GZ−1 instrument, it also started to provide mapping services through orthophotomaps. 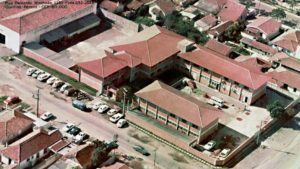 Thus, ESTEIO was one of the first Brazilian companies to be qualified in providing orthophotographic products. Since then, it has already executed thousands of square kilometers of mapping through orthophotograph. 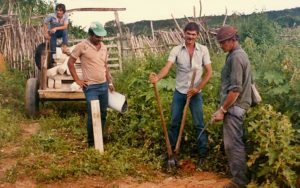 Also acting in the area of field surveys, in 1977 ESTEIO made a revolution in the rural cadastre survey methods, introducing the pre−signalization for photogrammetric measurement of plots in a real estate called Pepery, in the State of Santa Catarina, Brazil, service hired with INCRA − Instituto Nacional de Colonização e Reforma Agrária (Colonization and Land Reform National Institute). The growing need for the use of aerial-photogrammetric surveys as the foundation of project elaboration has taken ESTEIO to become equipped and gather a technical team to perform aerial survey services. Thus, in 1976, it was registered as category “A” company in EMFA − Estado Maior das Forças Armadas do Brasil (Armed Forces General Staff), beginning to perform aerial-photogrammetric coverage and conventional mapping. Established in 1969, ESTEIO ENGENHARIA E AEROLEVANTAMENTOS S.A. is a Brazilian private company. Acting as a consultancy company, in the beginning of its existence the activities were focused on performing projects and supervising civil engineering works, namely roads, railroads, airports, sanitation and electric power transmission lines. Therefore, since its establishment, ESTEIO has been dedicating itself to the consultancy in the transportation field, having executed a few thousands of kilometers worthy of projects, as well as more than 40 uninterrupted years of follow-up, supervision and inspection of works, including earthmoving, paving, draining, current artworks, leveling of slopes, containment works, bridges and elevations, geotechnics, hydrology, geology, functional plan, traffic study, budgeting, restoring and duplication projects, technical and economic feasibility study and RIMA for roads and railroads.